The use of crypto assets and distributed ledger technology in business and financial institutions promises secure, streamlined and faster processing of information. From specific functions such as supply chain and trade financing to more generic uses such as document management and processing systems, the potential uses for businesses and financial institutions are almost unlimited. 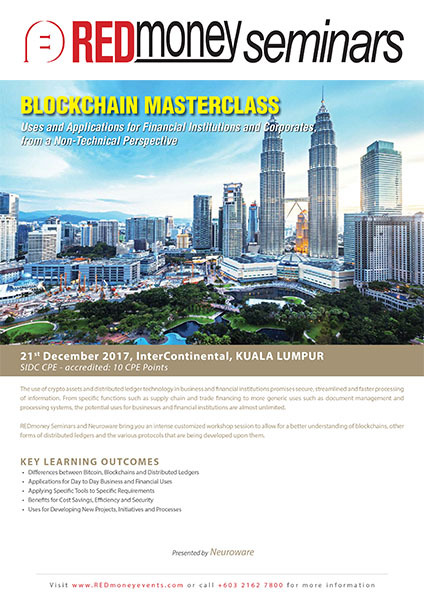 REDmoney Seminars and Neuroware bring you an intense customized workshop session to allow for a better understanding of blockchains, other forms of distributed ledgers and the various protocols that are being developed upon them. This one-day intensive workshop will benefit any professional looking to understand blockchains or distributed ledger technology and how they might be beneficial to their organizations. Such organizations includes banks and other financial institutions; as well as corporates, government departments and consultancies. What are the differences between bitcoin, blockchains & distributed ledgers? How do these different tools work? How can they be applied for day to day business and financial uses? Which specific tools can be best applied to your organization’s needs? What benefits will you see in cost savings, improved efficiency and security? How can they be used to develop new projects or business opportunities? This session is an introduction to distributed ledgers: what they are, why they are useful and how they can be applied to business and financial processes. The outcome of this session is for non-technical professionals to be able to differentiate between the various forms of distributed ledgers available, how and why we have them and what they can potentially be used for both now and in the future. From digital currencies to open assets & smart contracts; what can be done today and how can these tools be applied? This session will introduce the characteristics, uses and applications of crypto assets and currencies. The outcome of this session is for everyone in the room to own some form of cryptoasset, but more importantly, for them to understand where it is stored and why it has been stored that way. This will be a very hands-on session and will allow participants to gain practical experience of the application of crypto assets. Half of the session will be guided through presentations with the other half being spent actively using and exploring Blockchain technology through crypto-currency transactions. From paper, to brains through hardware or software - what are the differences? What are the potential uses for such applications in businesses and finance? Learn how data can be securely stored on the blockchains through an active use case involving digital certificates specifically designed for this class. We’ll undertake a quick review of what we have covered today and what can be taken back to your organization in terms of real ideas and initiatives.